A Yoann Huget try in the first minute stunned England, but it was Gael Fickou’s late effort that won the game for France. England had fought back to lead 24-19 having trailed 16-3 – Luther Burrell scoring a try on debut and Danny Care dictating play – but France stretched England in the 78th minute and Fickou skipped through defenders out wide to touch down under the posts, Maxime Machenaud converting. France – Tries: Huget 2, Fickou. Con: Machenaud. Pens: Doussain2, Machenaud. 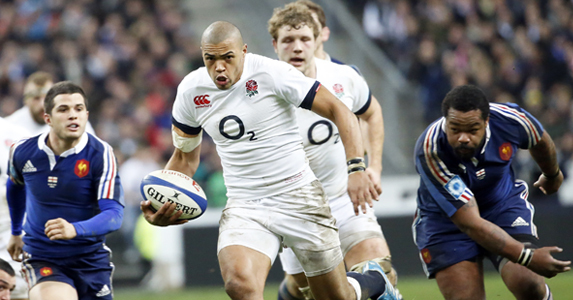 England – Tries: Brown, Burrell. Con: Farrell. Pens: Farrell 2, Goode. DG: Care. – Bernard Le Roux topped the tackle charts (12) despite leaving the field at half–time. Tom Wood (11) was England’s best tackler. – Brice Dulin made the most metres (106) while Billy Vunipola was the top carrier (17). – England enjoyed more possession (59%) and territory (63%), made more carries (153 to 104) and metres (591 to 499). – England conceded twice as many penalties as France – eight to four. – Jonny May broke his nose badly so is a serious doubt. 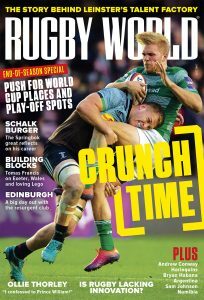 – Graham Rowntree bemoaned the six points England conceded at scrum time – they had a 60% scrum success rate – and said they will be looking at that area this week. – England were overrun at the breakdown in the first half, conceding numerous turnovers as ball-carriers ran into contact with no support and were left isolated. They need to be more intelligent in their breakdown play against Scotland or will struggle for quick ball. – There was also a little confusion early on with the back three, Nowell caught out a couple of times, but he recovered well and should be given more time to adapt. – France brought the flair back to their game, counter-attacking well from deep and feasting on turnover ball. If they can do that for 80 minutes against Italy – rather than in the spells they did here –they are likely to be two wins from two in the Six Nations. Brice Dulin; Yoann Huget, Wesley Fofana, Gael Fickou, Maxime Médard; Jules Plisson, Maxime Machenaud; Thomas Domingo, Dimitri Szarsewski, Nicolas Mas, Yoann Mestri, Pascal Papé, Yannick Nyanga, Bernard Le Roux, Louis Picamoles. Fickou gets a chance to show his talents in place of Bastareaud, who failed to make an impact against England. Also a good opportunity to see what Machenaud can do from the off while Maestri earned a start with his replacement performance. Alex Goode; Jack Nowell, Luther Burrell, Billy Twelvetrees, Mike Brown; Owen Farrell, Danny Care; Joe Marler, Dylan Hartley, Dan Cole, Joe Launchbury, Courtney Lawes, Tom Wood, Chris Robshaw, Billy Vunipola. If David Wilson was fit he’d be pushing his case to start ahead of Cole. With May injured and the likely heavy ground at Murrayfield, Goode starts at full-back, Brown is on the wing and Anthony Watson can provide a spark from the bench. The rest of the team get a chance to show a positive reaction to tough defeat. And replacements should be given careful consideration during the match – Dickson coming on for the influential Care on 60 minutes looked a little early given the state of the game.